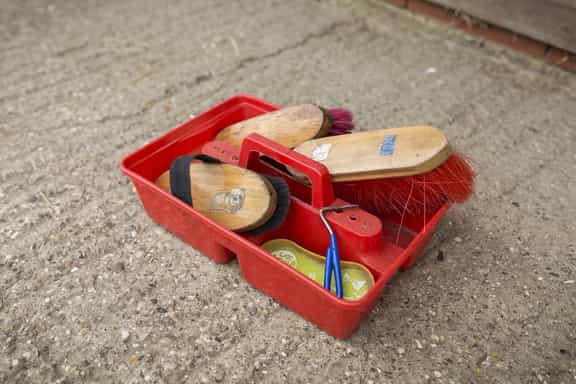 How often should I clean my horse's brushes? How often should you clean your horse's grooming brushes? Top groom Jenny Ellis answers just that. This depends on how often you use them. My horse is kept out in a field, so after grooming him once a day, I'll put mine in the washing machine once a week - usually at a weekend when I've got more time. If you use them more often, for example on a busy competition yard, it's advisable to wash them once a day. How do you wash your horse's brushes? I'll put them on a cool wash with non-biological washing powder, but no conditioner. I'll also add a numnah or furry girth cover to the wash to add a bit of padding for the machine. Plastic curry combs: should you use one on your horse? How can I keep my horse's teeth healthy?